This is the first release and comes from first fill Bourbon barrels. Loads of vanilla and marzipan in the smell with some notes of fresh fruit. Not many different flavors here, but the once that are present, are very compact - almost thick! Very pleasant. Let it settle in the glass for some minutes and the sweet flavors really comes forward. A lot more is going on in the taste. Some fresh white fruits at first that almost instantly turns into sugary notes. Again it feels very thick. A lovely feeling in the mouth. In the finish some fine notes of lemons appear with some gentle oak. 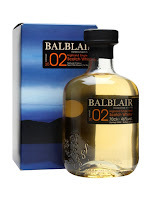 This is not very spectacular, but just a fine dram from start to finish. I really like the wood management and the cask selection at Balblair. It really seems like they are very thorough every step of the way. I will give this 84/100 (21/21/21/21).